The premise of the Teaching American History (TAH) project—a discretionary grant program funded under the U.S. Department of Education’s Elementary and Secondary Education Act— is that in order to teach history better, teachers need to know more history. Unique among professional development programs in emphasizing specific content to be taught over a particular pedagogical approach, TAH grants assist schools in implementing scientifically-based research methods for improving the quality of instruction, professional development, and teacher education in American history. Illustrating the diversity of these programs as they have been implemented in local education agencies throughout the nation, this collection of essays and research reports from TAH participants provides models for historians, teachers, teacher educators, and others interested in the teaching and learning of American History, and presents examples of lessons learned from a cross-section of TAH projects. 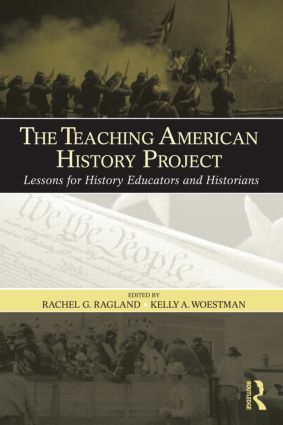 Each chapter presents a narrative of innovation, documenting collaboration between classroom, community, and the academy that gives immediate and obvious relevance to the teaching and learning process of American history. By sharing these narratives, this book expands the impact of emerging practices from individual TAH projects to reach a larger audience across the nation.